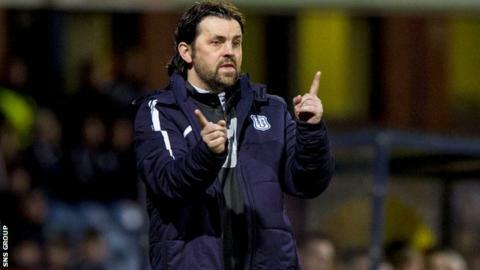 Manager Paul Hartley is asking for one final push as Dundee seek to wrap up the Championship title. The 37-year-old is aiming for a remarkable third consecutive promotion, having led Alloa from the bottom tier before moving to Dens Park in February. And victory at home to Dumbarton will secure a swift return to the top flight for the Dark Blues. "We believe we are a Premiership club but we need to do the business on Saturday," Hartley told BBC Scotland. Dundee briefly lost their perch at the top of the table when they suffered a surprise loss to relegated Morton but Hamilton surrendered their lead last weekend when they were thumped 4-1 by Dumbarton and Hartley's side moved two points clear with a 3-0 win at Alloa. Falkirk also slipped last Saturday, drawing 1-1 at Morton to drop three points behind Dundee. The leaders also have the best goal difference of the trio, so a draw against the Sons would be enough, barring a nine-goal win for Accies at home to Morton. "If we do our job on Saturday, we'll be crowned champions but football doesn't always work out like that," said Hartley. "If you'd said to the players at the start of the season that they'd have one game at home to Dumbarton to win the title then they'd have taken that. "Dumbarton will come and play with a freedom. They've shown over the season that they are very tough opposition. "But it's looking like being one of the biggest crowds at Dens Park for years and hopefully that will drive the players on. "The players are looking forward to it and we are preparing like we would for any other game. They need to keep their focus and be as professional as they can. They all need to give 100% and make sure they have no regrets. "There has been pressure on the team because everyone has classed us as favourites. But I don't think there is an easy game in this division." Falkirk end the league campaign at home to Alloa, hoping Dundee lose and Accies fail to win. "It's so exciting and it's great to be a part of it," said manager Gary Holt. "We're the outsiders. We need someone to do us turn. "Alloa have got something to play for (avoiding the relegation play-off) because they don't know what Cowdenbeath are going to do, so it should be an open game. "If we are at it, we should get the goals to get the win, then it's down to lady luck. "It's been a long, hard season and I'll be asking the players to go and enjoy a home game, play with smiles on their faces. If it means we are in the play-offs then we'll embrace that."